Whole wheat banana chia muffins are light and fluffy without butter, oil, or refined sugars. 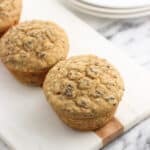 These healthy muffins feature chia seeds for added nutrition and make a great breakfast or snack! Under 150 calories per muffin. Preheat oven to 350°F. Spray a 12-cup muffin tin with cooking spray and set aside. Add flour, baking powder, salt, cinnamon, baking soda, and ground nutmeg to a bowl and whisk to combine. Add bananas, milk, yogurt, maple syrup, and eggs to a separate bowl and mix until light and creamy. Divide muffin batter equally between the twelve muffin cups and bake for 18-21 minutes, or until the tops spring back when lightly pressed and a tester inserted into the tallest part of the muffin comes out clean. Let muffins cool in the tin for 10 minutes, and then remove to cool completely on a wire rack. 5.3 oz of Greek yogurt is roughly equivalent to 1/2 cup.